Mostly cloudy skies with a few showers after midnight. Low 51F. Winds S at 10 to 15 mph. Chance of rain 30%..
Mostly cloudy skies with a few showers after midnight. Low 51F. Winds S at 10 to 15 mph. Chance of rain 30%. The 7th-seeded Louisville Fire brought their A-game to Spokane, while penalties, fumbles, and dropped passes hurt the Shock who struggled on both sides of the ball. 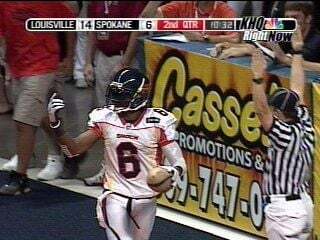 The run for the ArenaCup title ended Saturday for the Spokane Shock as they were defeated by the Louisville Fire, 62-35. Though the Shock fell to the Fire Saturday night, they ended their season as leaders of the Western Conference and with a winning season (12-4, 0-1 playoffs). Louisville played strong on the offense and the defense. The Fire came out in the first quarter ready to win as they recovered a fumble resulting in a 17 yard pass from QB Joel Steel to WR Tiger Jones for the touchdown in the following play. Steele's (14-23, 253 yards and five touchdowns) go-to man of the night was Jones, who led the team with seven receptions for 121 yards and three touchdowns. Their defense held the Shock to seven points in the first half, proving why their defense is top ten in the league. DB Jerome Jones was named defensive player of the night with an outstanding performance, tallying seven tackles and one forced fumble. The Fire's defensive efforts helped maintain their early lead throughout the remainder of the game. "They rattled us early and we couldn't get back on track," said Head Coach Adam Shackleford. "Playing catch up is not easy." Spokane turned over the ball at key moments of the game, with two fourth down turnovers and four fumbles throughout, but the Shock fought back with heart. QB Andrico Hines and the Shock offense (33-55, 357 yards and five touchdowns) turned in 28 points in the second half, with Kelvin Dickens leading the team with a franchise record setting 17 receptions (previously held at 15 by Charles Frederick) for 191 yards and two touchdowns. "We were a better team all season long," said Hines. "We won as a team and tonight we lost as a team." The Fire will advance to the next round of the playoffs, facing the 6th seed Green Bay Blizzards who defeated the 3rd seed Quad City Steamwheelers tonight 39-34.